Benjamin's green and brown nursery decor holds many inspiring decorative details including the earthy blend of colors accented with the bright "POP" of bright orange in the baby's personalized, safari themed crib quilt where we see just a peek of baby blue elephants, tigers and other jungle animals. And speaking of jungle animals, Benjamin's dad made the delightful artwork featuring framed silhouettes of a rhinoceros, a giraffe and an elephant that are decorating the nursery walls over the baby bed. He made them and had them printed on photo paper. The animals' silhouettes were mounted on a border of scrapbooking paper and then framed in frames that are manufactured specifically for record album covers. Benjamin's toy chest was made for his dad by his grandfather when he was a kid but it has been stripped, stained and resealed to match the baby's green and brown nursery decor. 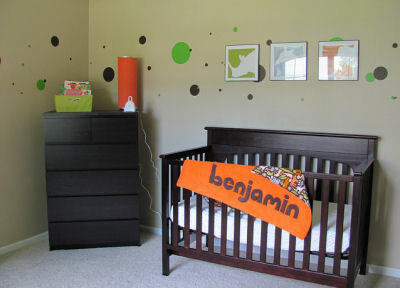 Thanks to Jessica for sharing her baby nursery decorating ideas and Benjamin's nursery pictures with us! 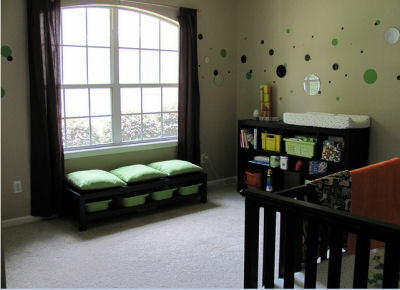 This is one cute room and I'm sure that many mommies will be duplicating this design! Before you leave to browse in other areas of the website, please take a moment to vote for Jessica in our baby nursery contest! 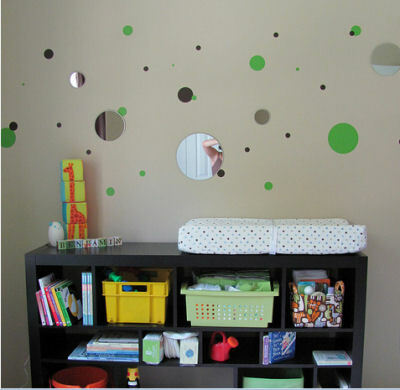 I love this colour scheme and decoration, its so versatile for when he grows up. The chest is a sweet touch that I'm sure he'll treasure. Join in and write your own page! It's easy to do. How? Simply click here to return to GREEN and BROWN NURSERY IDEAS.